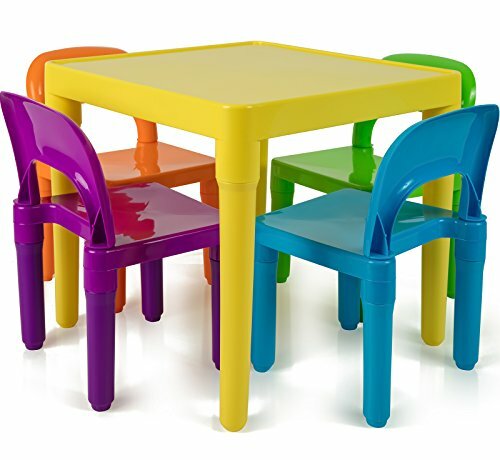 The Den Haven Kids Table and Chair Set is a colorful addition to your home and a great place for your children to play games. Made with durable BPA-free plastics the table and chair set is perfect for playrooms, classrooms, daycares, Sunday schools and kids rooms. The set includes 5 bright colors are ideal for both girls and boys rooms. Use as a game table, Lego table or a place to put your children's favorite toys, puzzles and coloring books. Durable plastics are tough enough to stand up to the wear and tear of kids but light enough for them to easily move on their own. Easy to clean surface won't leave a mark on walls or floors. Table can be disassembled for easy storage or travel. A must have for daycares and nursery's. Also Ideal for waiting rooms, and doctors offices, any space where children need a play place. Promote your child's imagination while providing them a safe and colorful place to learn and play with this fun and affordable table and chairs set. Table and Chairs come disassembled and can be put together without tools or hardware in a snap. DIMENSIONS: The table measures 20x20x17 Inches. The chairs measure 12x11x18 Inches. EFFICIENT STORAGE: You can either stack the chairs and table on top of each other, or quickly disassemble the set for easy storage. DIFFERENT COLORS: The chairs are orange, green, blue and purple. The table is yellow. AGES 3 & UP: Perfect for classrooms, playrooms, daycares, and schools. Can also be used as a little desk for your little learner. STURDY PLASTIC: A lightweight and durable design; easy to transport but strong enough to with stand the wear and tear of children.